After the death of the last Saxon king in 1024, the crown passed to the Salians, a Frankish tribe. 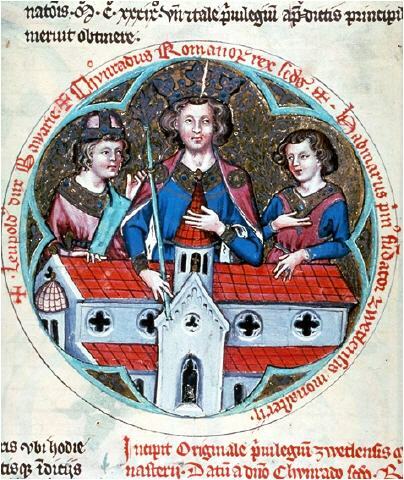 The four Salian kings--Conrad II, Henry III, Henry IV, and Henry V--who ruled Germany as kings from 1024 to 1125, established their monarchy as a major European power. Their main accomplishment was the development of a permanent administrative system based on a class of public officials answerable to the crown. A principal reason for the success of the early Salians was their alliance with the church, a policy begun by Otto I, which gave them the material support they needed to subdue rebellious dukes. In time, however, the church came to regret this close relationship. 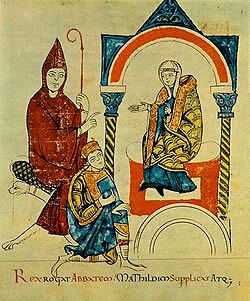 The relationship broke down in 1075 during what came to be known as the Investiture Contest, a struggle in which the reformist pope, Gregory VII, demanded that Henry IV (r. 1056-1106) renounce his rights over the German church. The pope also attacked the concept of monarchy by divine right and gained the support of significant elements of the German nobility interested in limiting imperial absolutism. More important, the pope forbade church officials under pain of excommunication to support Henry as they had so freely done in the past. In the end, Henry journeyed to Canossa in northern Italy in 1077 to do penance and to receive absolution from the pope. However, he resumed the practice of lay investiture (appointment of religious officials by civil authorities) and arranged the election of an antipope. The German monarch's struggle with the papacy resulted in a war that ravaged German lands from 1077 until the Concordat of Worms in 1122. This agreement stipulated that the pope was to appoint high church officials but gave the German king the right to veto the papal choices. Imperial control of Italy was lost for a time, and the imperial crown became dependent on the political support of competing aristocratic factions. Feudalism also became more widespread as freemen sought protection by swearing allegiance to a lord. These powerful local rulers, having thereby acquired extensive territories and large military retinues, took over administration within their territories and organized it around an increasing number of castles. The most powerful of these local rulers came to be called princes rather than dukes. According to the laws of the German feudal system, the king had no claims on the vassals of the other princes, only on those living within his family's territory. Lacking the support of the formerly independent vassals and weakened by the increasing hostility of the church, the monarchy lost its preeminence. Thus, the Investiture Contest strengthened local power in Germany in contrast to what was happening in France and England, where the growth of a centralized royal power was under way. The Investiture Contest had an additional effect. The long struggle between emperor and pope hurt Germany's intellectual life--in this period largely confined to monasteries--and Germany no longer led or even kept pace with developments occurring in France and Italy. For instance, no universities were founded in Germany until the fourteenth century.